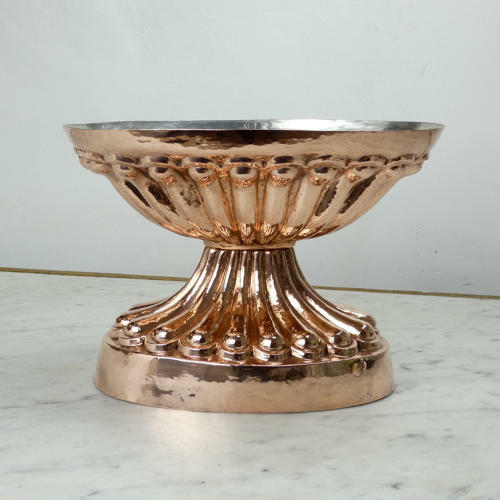 A large, and very fine quality, two part copper nougat or ice mould. This mould is unmarked but it is a French and probably made by Trottier. It dates from c.1870. This is a large mould for one of its' type. It is a very elaborate shape and it is made from a substantial gauge of copper. Both the top and the bottom have a matching, deeply fluted design which is very well moulded. It is well made and the two parts fit together very neatly. This type of mould was used for making a table centrepiece out of nougat or ice and this would then be filled, usually with small, fruit shaped ice creams. This example is in excellent condition and we have had the interior re-tinned so that it can be used.